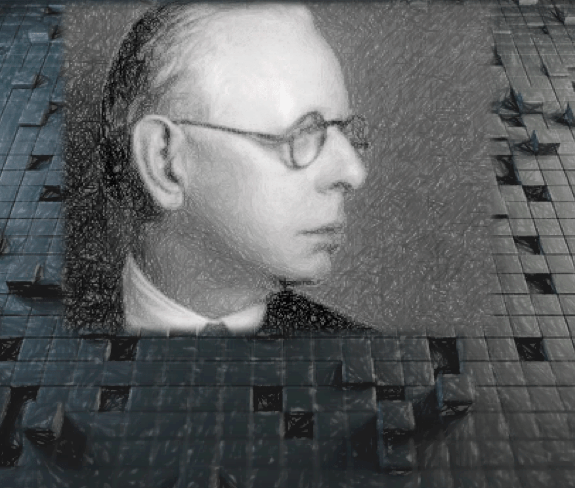 Jesse Livermore, who is thought to be the grandfather of stock trading, was born in 1877 and died in 1940. Although Jesse traded more than 100 years ago, the principles he used for trading at the time are still practiced firmly by many of the legend’s followers today. He was an ordinary American citizen who rose to riches through trading and also saw his share of multi-million dollar losses. ‘Boy Plunger’ was the nickname given to him early in his life when he started his journey towards a successful future as a trader through various bucket shops, which is another name for gambling houses. He used to trade there and started at the tender age of fifteen. When Livermore turned 40, he already had a $100 million fortune which in today’s terms can amount up to $6 billion dollars, a staggering amount. And he rose to fame when he shorted the market in 1929 when the entire US stock exchange was crippled. Jesse was an active and successful trader in the US even before the great spike and plunge of the US economy. The Civil War, having been long over, people still remembered it. However, it was also era of great industrial development in the US at the time which presented a great deal of opportunities for smart traders and businessmen. It was at this time that America rose to becoming a safe haven for all who needed shelter and food. This induced a massive influx of settlers who chose to escape the endless hardships of the Old World to embark on new beginnings through hard and honest labour. And this is what Jesse Livermore loved and the sort of environment he chose to invest in. He got involved with people like Henry Osborne Havemeyer, the owner of American Sugar Refining Co, along with the owner of the National City Bank, which has become Citigroup today, E.H. Harriman, the master of the railroads, J.P. Morgan legendary banker and the founder of Standard Oil, William Rockefellar. He was rolling with all the big people responsible for developing these booming industries. Livermore was familiar with each and every industry, from coal to coffee, to sugar and the world of banking, which meant he had a tremendous amount of knowledge and information available to him at any given time. 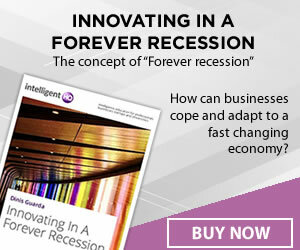 Yet with all that knowledge, Livermore was convinced not to anticipate anything in the market and chose to be patient and let things swing in the way his knowledge enabled to predict and believe that it should and it did, so he did what he did best: invested in a bullish market and shorted in a bear market. However, Livermore’s personal life was not as successful as one might imagine. Having endured three unsuccessful marriages he was also stricken with clinical depression which had been with him for a long time. And this is what led him to taking his own life in 1940. 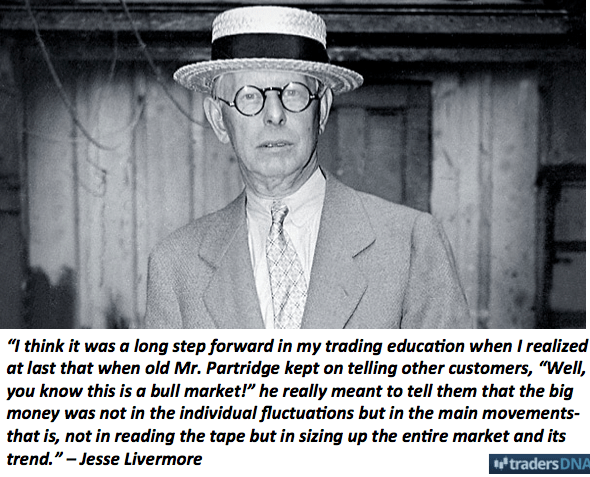 Although Jesse Livermore was active along time ago, trading in commodities and stocks, making millions. Believe it or not, the methods and principles he used are not so different from today’s financial world and just as legitimate. Jesse Livermore used to say a successful trader never acts on his own instincts until the market has deemed his instincts correct. If you try to understand the meaning behind what Livermore was talking about, it would do you good to remember you are in the market to make investments and not to form prophesies. And many of the successful traders today follow in Jesse’s footsteps, which is not to anticipate but to follow the markets to a more fruitful return. The maestro also used to stress on the fact a trader can never buck the stock market, because there is never anything new. However, there are always variations of the same patterns, insightful for a man who traded 10 decades ago. Livermore also emphasized on the fact one should never trade when he is unsure of the opportunities in the market, learn to hold money. This means all good trades need time and a lot of patience and greed is the worst enemy of a trader. 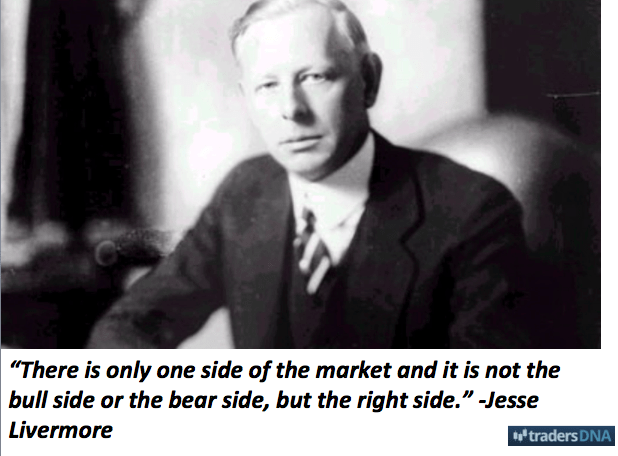 All in all, Jesse Livermore’s wisdom still carries out, even today where everything is modernized in the world of stock, hedge funds and ETFs.